Rewind a year. Me: 26 and FOJ (fresh out of a job). Having saved up a fair amount from my 9-5, I was largely living off savings. Nevertheless, I was thoroughly enjoying life: making money online by freelancing SEO services, and seeing the world. After two years of long work hours, I was finally free. I committed to take my time, network, and enjoy life for a few months before diving head first into building a business. 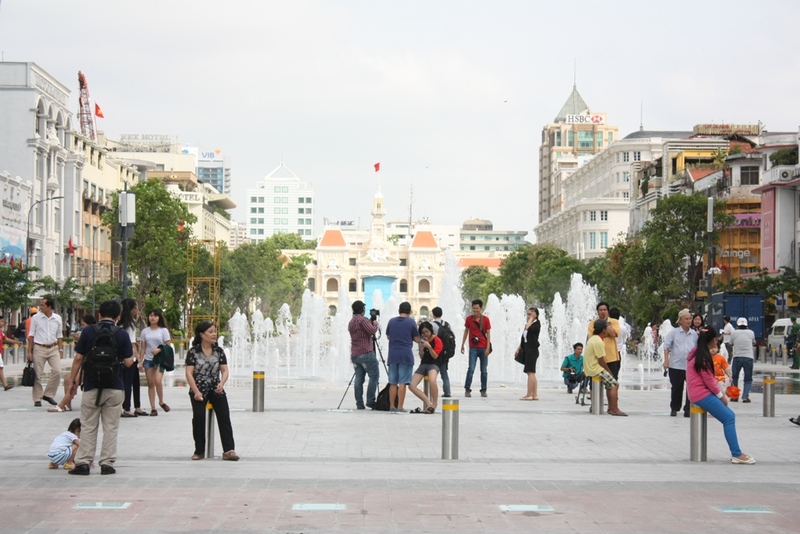 The natural next step was to move halfway around the world to Saigon, Vietnam. What future could there possibly be in a war-torn third-world country (so I pondered)? As it happens, Saigon (officially known as Ho Chi Minh City) has a lot going for it, and most people are blissfully unaware of that fact. To be precise, 95 percent of people recently surveyed in Vietnam feel that… “Most people are better off in a free market economy, even though some people are rich and some are poor.” The great irony is that together with China, Cuba, Laos and North Korea, Vietnam is one of five countries still governed by a party whose official doctrine is communism. A bright future, but not why I’m here.I could freelance from anywhere – Europe, Asia, or my parents’ basement. I chose Vietnam not for its economic potential, but to connect with the community of entrepreneurs already there. It was one of the best decisions I ever made, both in terms of the people I’ve met and the ways my business has grown. Cities are hives of connectivity and ultimately, the people make the place. The types of people a city attracts, what they’re doing, and how they connect make or break cities. I spent 3 months in the city, getting to know the culture, settling into a routine, meeting the community and generally enjoying life to its fullest. When my 3-month Visa expired, I left for other parts of Asia, then Europe for the summer. All told, living in Saigon was an amazing experience. The level of freedom there is incredible – almost any food or service is available at your finger tips for a small fraction of what you’d pay in the US. I tried all sorts of travel in the mean time: traveling in groups in Europe, Asia, traveling solo in both, with a partner, all the while playing hard and working harder. I danced by firelight on remote sandy beaches in the Philippines, partied in the ruins of Budapest and swam in the crystal clear waters of the Adriatic off the Croatian coast. But something about Saigon stuck, and I ached to return. The experience I had – the people, the culture, the adventure – pulled me back like a magnet. After moving back this past November, I reflect back on what’s changed in a year, and what it’s like to return after a year away. When I landed in Saigon on November 1, 2014, the delightful culture shock stuck around for almost a month. The excitement of a new city, new surroundings and new friends is a wonderful high, and I gleefully rode it for a month into December. The second time around, that high lasted no more than a few days. Even with a new house, new roommates, a new neighborhood and new friends (this time, I sought to make as many local friends as possible rather than live in the “expat bubble”), the honeymoon phase was short-lived. But here’s what I learned: when the honeymoon phase wears off is when the real fun starts. It’s when I began to see more of the city, explore other districts, venture out solo and make new friends. I started to see and appreciate the nuances, the small interactions with locals, and discover new cafes and restaurants off the beaten path. As a self-proclaimed “bro” in the DC (young, mid-20s bachelor), many of my closest friends in the entrepreneurship community here are in the similar phases of life: we focus on building businesses, living healthy and active lifestyles. In that regard, our identities are more solid. In the past year, we’ve read more books, had more experience, gotten more success – and we’re all more comfortable and confident in ourselves as a result. This has changed the nature of our conversations: we’re focused on bigger and better things, our businesses are growing faster and we’re looking at the next level of growth in most areas of life. The old crew has changed, but we’re more ourselves. There’s also an expansion, with more new faces, both from within the community and without. The buzz of Ho Chi Minh has young entrepreneurs coming in droves, and it’s been fun to meet many of the new faces, this time as someone who – relative to the average Saigon novice – “knows” the city. As my success and confidence grows, so too so my general optionality in the dating pool. I find it much easier to find and date than my first time here in Saigon. Part of this is, of course, a general level of comfort and familiarity with the city and a social circle here. When I landed in Saigon in 2014, I was unfamiliar with dating in Asia and it took me weeks before things “clicked”. Those few weeks were, admittedly, uncomfortable as a floundered my way around. That said, having more options doesn’t mean you need to follow through on them all. This freedom was, at first, exciting and liberating. But with an overemphasis on relationships and dating, life was out of balance, and it quickly became draining. A word of advice to my future self, setting foot in Saigon on November 1, 2016: think about what you want, how to find it, and go get it. That’s where the real fun lies. I am what you would call a bit of a health and fitness fanatic. Usually the first to order a salad when I’m out at dinner with friends, my mom will even ask if I have any special “meal requests” around the holidays. Staying healthy in Asia isn’t easy. Most local dishes are carb-heavy, using rice or noodles as staples. And while the “authentic” travel experience would be to sample it all, that’s not my thing. I prefer to stay healthy on the road, sticking to a diet that keeps me happy and clear-headed. So it brought a smile to my face when I returned to Saigon to find that the number of green smoothie and juice stalls had multiplied. Last year, the smoothies-with-vegetables market was cornered by two spots: Juicy and Guanabana. Recently, two new smoothie stores opened up right in 18A (the alley many expats and digital nomads call home): JuicElixir and another. And the price? A whopping 35,000 VND (about $1.50). The same smoothie in LA, New York, or even Bangkok would set you back $5-6 or more. The list goes on. Just 6 months ago, a salad and healthy juice store opened next door to my new apartment. The salad store is now a regular addition to my daily health eatabout routine. Perhaps this is largely confirmation bias. My eating habits have gotten progressively healthier over the past year, making it seem like there are more healthy options. But I’m not alone. I’ve crossed paths with friends here more often at a local vegan spot than our previous “ritual” roadside BBQ joint. Even in westernized Bangkok, green juice and smoothie shops are hard to find. Convenient, healthy eats are a welcome addition in Saigon version 2.0. Traffic in Saigon is bad. Reallly bad. So much so that traffic jams are their own kind of tourist attraction. It’s a thing for people to pull out their selfie sticks and capture the chaos on the streets of Saigon. Search YouTube for “saigon/ho chi minh intersection” and you’ll find a collection of hilarious videos showcasing the motorbike mayhem. Amusing as it may be to the outside observer, driving, walking, and biking in and around this traffic is like breathing a constant stream of exhaust. Plans are in the works to clean up Vietnam’s fuel emissions standards, by anyone who’s been to Ho Chi Minh can tell you: those plans are far from the reality on the ground. Many of the trucks – and motorbikes – spew dark black smoke. And with the slow, weaving pace of traffic there, it’s tough to escape the fumes. Pollution masks help a little, but not enough to prevent the pollution from taking its toll. There’s a large body of research proving the correlation between pollution and chronic diseases like cancer and neurodegenerative diseases. Not surprisingly, a recent study found that air pollution affects short-term memory, IQ and brain metabolic ratios. Yikes. Speaking for myself, after about 2-3 weeks of living in Saigon, I very quickly noticed the effects of pollution this time around. It manifests in more anxiety and a difficulty sleeping. Perhaps, the excitement and honeymoon phase my first time here masked the effects, but they were very apparent this time. As much as I love this city, I know that I won’t last more than 3 months. One way that Saigoneers avoid the effects of pollution is by taking periodic mini-vacations out of the city. The air is clearer in nearby cities like Phu Quoc, Mui Ne, Nha Trang, Da Lat, and Da Nang. And when plane tickets are dirt cheap, it’s a fun excuse to explore different parts of Vietnam and experience different aspects of Vietnamese culture. That said, I don’t want to live in a city where leaving every month or so is a necessary condition for staying sane (and it is). Perhaps I’ve been spoiled, living in US cities with some of the nicest green space of any: San Francisco, Chicago, Boston, Boulder. For me, nature is a prerequisite for happiness. When my 3-month visa expires, it’s on to find greener pastures. In spite of the smog, Saigon is the first place in a long time where I feel at home. When you feel at home, it’s easy to take the next step into uncertain territory, to stretch outside the comfort zone. Everything has a new level of ease and clarity: making new friends, seeing more of the city, and working on my business all became easier. Being back has its rewards: quickly settling into a routine, seeing familiar faces, and knowing my around. The city itself changed in 2015. The events calendar seems even more full of concerts and activities, and new restaurants and cafes have popped up all over the city. Construction finally ended on the new walking mall downtown. Some things haven’t changed much. The charming hipster scene and unique cafe culture are still here. Lush is still rocks on Tuesdays, Outcast chills on Sundays, and the weed Granny hasn’t moved from her perch on Bui Vien. Saigon ultimately changed by staying the same, being more of itself, and not losing the things I loved about it. Most importantly, I found a home base. Saigon will never be more than a temporary home, but it’s an amazing feeling to have a home halfway around the world. I hope it’s the first of many. With the right friends and with any luck, 2016 will be the year where I discover another.